Quantity options allow you to get specific information on how many of a product you offer for sale. We offer several ways to track quantities, either globally or by individual options you may have. For example, you may sell 50 tshirts and want to track them globally. Each time a sale occurs, one is taken from the inventory. If you want to track at the option level, you may have 50 tshirts that consist of 20 small, 20 medium, and 10 large. In this case, you can track these individual option items. This setting lets you specify how many total in stock you have. Optionally, you can set a minimum and maximum of quantity for a product. These minimums and maximums will only allow the user to checkout with this amount in their cart. To use fine detailed option item quantity tracking, you first setup options for your product, which you can learn about by clicking here. 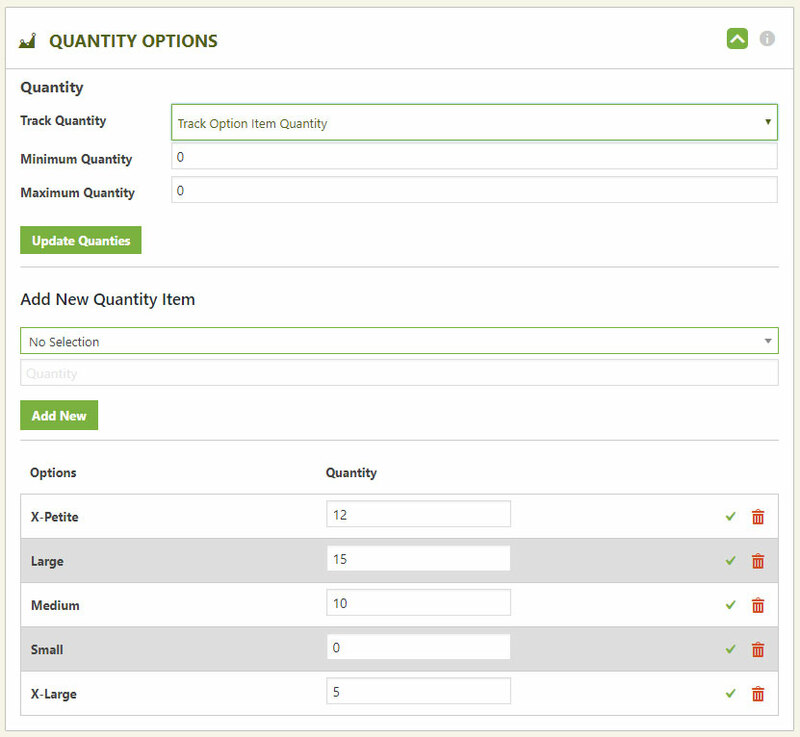 Once you have options attached to a product, you can select in this location to track option item quantities. Now you just specify how many of each option you offer. If you have a lot of option choices, it can be a lot of quantities to track with every combination of option needing to be accounted for. Because of the vastness of option item quantity tracking, we have created an export/import process to help speed this process up. To use the export/import process, you simply will export the CSV file, edit it quickly in a spreadsheet application, then import them back up. This process can quickly allow you to export existing quantities as well, update them, and re-import them.